This post has been read 4541 times! It was a great pleasure to meet the Michelin-starred chef at Bâtard, Markus Glocker. He called us up when he heard that we were making a series about schnitzel and invited us to watch him in action. We filmed him preparing his famous schnitzel, which is made with chicken, and also has a side of dark meat chicken leg and thigh. 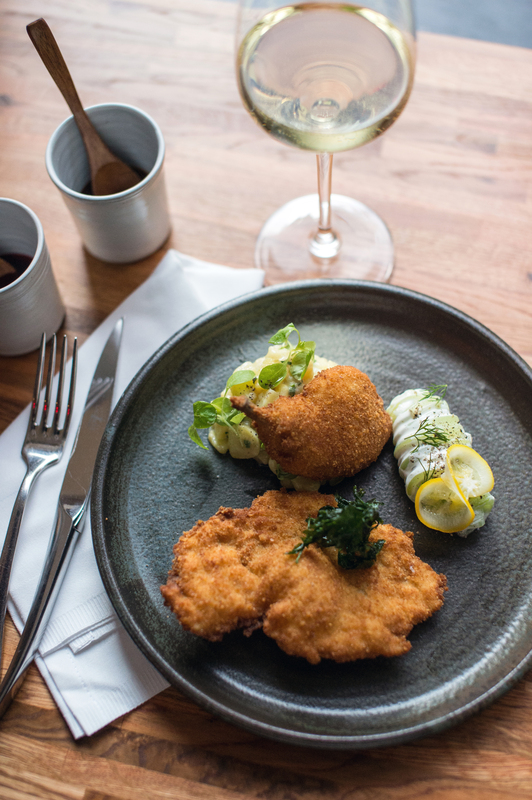 They use clarified butter rather than oil to fry the schnitzel. It is a much more expensive method, and creates a better taste. Like our Brushstroke tour, it is fascinating to see all that goes into a fine dining entree. The insight actually makes the food taste better. Mr. Glocker’s food is truly worthy of the accolades. If you visit Bâtard, tell them you would like the schnitzel as seen on BP.TV, because it is not on the menu. This entry was posted in Austrian, Cooking tips, Food Essays, French, Restaurants, Reviews, TriBeCa. Bookmark the permalink. Schnitzel Lovers Unite! You captured Chef Markus Glocker’s dedication and professionalism very nicely. He is creative and level-headed, and a prime reason that Bâtard has received so many plaudits. There’s integrity in his cooking, and we’re glad you had a chance to see it and taste it. In a troubled, tumultuous world, there’s always the comfort of a good Schnitzel!